There are just over two weeks left until the Municipal Heritage Forum gets underway in Lacombe. After upping our numbers (twice!) we have approximately 20 spots left for those of you who haven’t yet registered. Online registration closes Tuesday October 7th at 11PM. This year we have another great mix of speakers to get you thinking about heritage conservation in Alberta. In addition to our keynote speakers Kayla Jonas Galvin and Larry Laliberte who will be showcasing our theme of “Conservation Through Technology and Innovation”, we will have nine Municipal Show & Tell presentations and ten break-out sessions. Speakers will be talking about all things heritage including: mapping projects, alteration approvals, heritage awards programs, social media and sustainability (among others), as well as case studies from several Alberta communities who are being creative in their approach to heritage awareness and conservation initiatives. 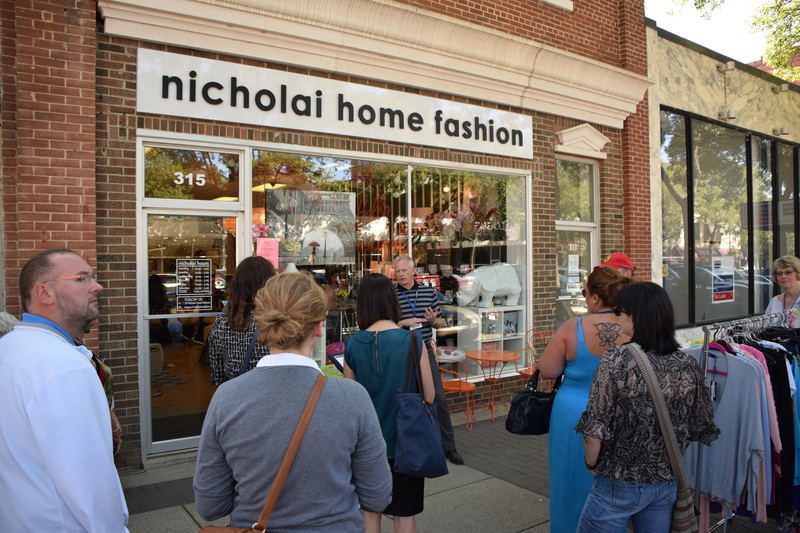 In addition to the presentations, the Lacombe and District Historical Society will be hosting us on a walking tour of historic downtown Lacombe. This year we have the additional fortunate to have the Forum coincide with the biennial AHRF Awards ceremony. Click here to access a copy of the Forum program, including descriptions of the presentations. There are always new people to meet and great conversations to be had. We look forward to seeing you there! The Board of the Alberta Historical Resources Foundation met in Pincher Creek, September 12th-13th, 2014. Since this meeting was not one where the Board was actively adjudicating many grant applications, the focus was more on policies and other planning to help conserve and celebrate Alberta’s heritage. 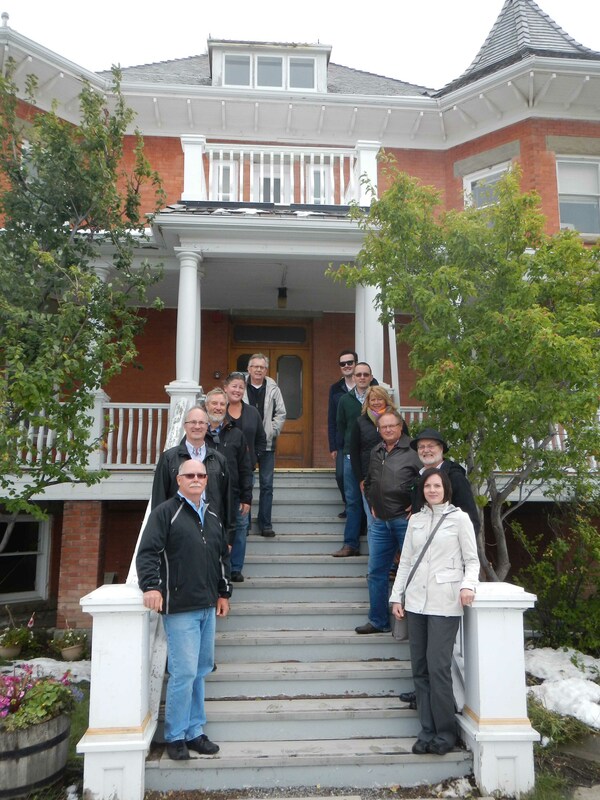 The Board of the Alberta Historical Resources Foundation, on the steps of Lebel Mansion, the Town of Pincher Creek’s first designated Municipal HIstoric Resource. As is their custom, Board members took the opportunity to explore some of the local historic places in the community where they met. The Town of Pincher Creek’s Director of Community Services, Diane Burt Stuckey, and Curator of the Kootenai Brown Pioneer Village Museum, Farley Wuth, led an informative tour of locally significant historic places, as well as two community museums. Some of the historic places featured on the driving tour included an historic buffalo jump site on the west side of town, and also the Lebel Mansion, newly designated by the Town as as Municipal Historic Resource. Originally built as a grand residence by the merchant Timothee Lebel, the building later served as hospital, and now as the home for the Allied Arts Council. It is a great example of another historic place serving the cultural community in Alberta. After a visit to Heritage Acres Farm Museum, where the Board was able to see first-hand the extensive collection of agricultural equipment, Board Chair Fred Bradley facilitated a meaningful conversation with local heritage-sectors leaders and municipal officials, including Town of Pincher Creek Mayor Don Anderberg, and M.D. of Pincher Creek Reeve Brian Hammond. The Foundation was able to hear and discuss issues that are important to local communities working hard to conserve their heritage. After a busy day of seeing the sites and learning more about the history of Pincher Creek, the Board settled in for its day-long meeting, involving a broad range of issues affecting the heritage community across Alberta. Future posts will showcase some of the decision made in Pincher Creek, so stay tuned to RETROactive! The next meeting of the Alberta Historical Resources Foundation will take place in Edmonton, November 28th-29th. Though I can’t imagine what could be more riveting than reading about administrative procedure, I’ve been told that some people might not feel the same way. So since not all our blog posts can be nail biters I will have to ask folks to bear with me on this one. This post might be a bit dry but it does include important information about the Municipal Heritage Partnership Program (MHPP) for interested applicants. Those of you who have applied for Municipal Heritage Partnership Program (MHPP) funding for a survey, inventory or management plan in the past will likely have visited the MHPP website to obtain information about the grant categories, funding parameters and suggested application information. I am pleased to report that we now have all the information necessary to put together your MHPP grant application available as a Guideline document. This handy reference outlines the three grant categories and details the policy and procedures around the funding process, including eligibility requirements, application deadlines, in-kind contributions and timelines as well as an application checklist. You can access a copy by clicking here. Please contact Matthew, Michael or myself with any questions you may have about the MHPP grant application process. For those of you who actually read this far, well done! If it weren’t for Internet copyright issues I would reward you with a picture of an adorable puppy. 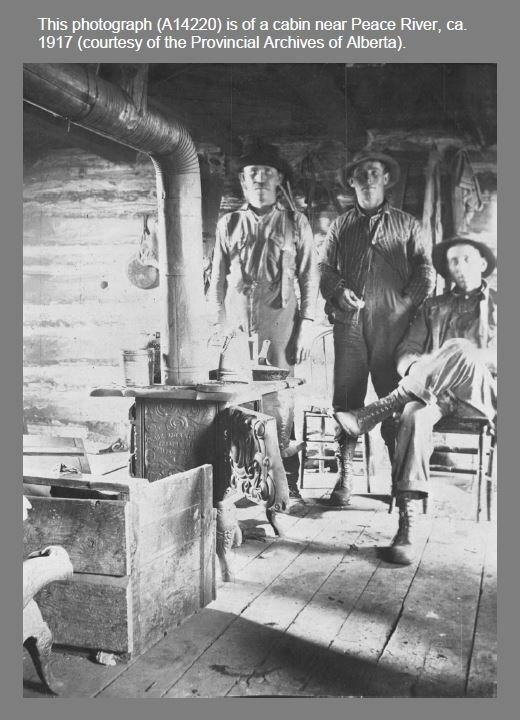 Cabins performed a variety of functions in Alberta’s past from homesteading to hunting and post offices to ranger cabins. Many events and daily challenges that defined our province unfolded on the wooden floors of early cabins. Just like the characters they housed, each cabin’s architecture and associated artifacts are unique. 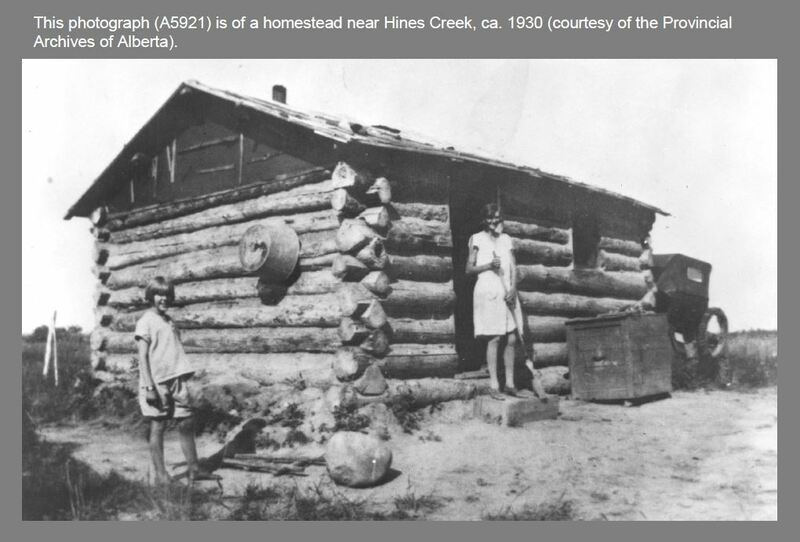 To encourage an appreciation of cabins and the surviving record of them, as well as other historic resources in the province, a collaborative team from the Historic Resources Management Branch, the University of Alberta, and the Royal Alberta Museum initiated the Heritage Art Series. The goal is to create artworks that depict scenes from Alberta’s past that captivate public audiences. We hope that these artworks, like the cabin painting above, stimulate an interest in learning about our province’s heritage, which will in turn instill a greater respect for the past. Cabins were typically made of raw timbers with a variety of corner joints, roofs, sawn floorboards, and chimneys. Associated features include outhouses, garbage pits, ice houses (for storing food), cellars, and drying racks. What can the archaeological record tell us about cabins and their occupants? Maps of cabins and associated structures reveal how people utilized landscapes and interacted with each other within cabins. Our modern homes are often relatively large with multiple rooms and levels, which is drastically different from the single-room cabins that many Albertans spent their lives in. An historical perspective informs us that changes in domestic architecture have had a real impact on the way Alberta’s families interact with each other and with their neighbours. Cabins are often associated with historic trails that influenced how regions were settled and how goods were transported across the country. Cabin modifications over time tell stories of trial-and-error adaptations to new landscapes while artifacts can indicate the types of activities conducted around cabins, cultural affinities, number of occupants, and the season of occupation. Outhouses and garbage pits can reveal past diets, wealth, access to luxury goods, hygiene, medical conditions, and entertainment. 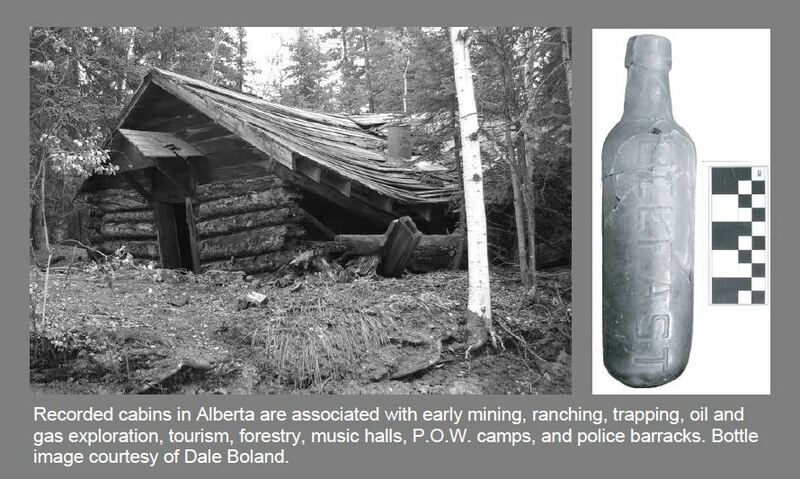 Aside from cabins’ phsycial make-up and artifact assemblages, they are significant heritage resources because they were often the first permanent structures to appear on many of Alberta’s landscapes. They represent a new adaptation and a new way of life for the people who first built them. 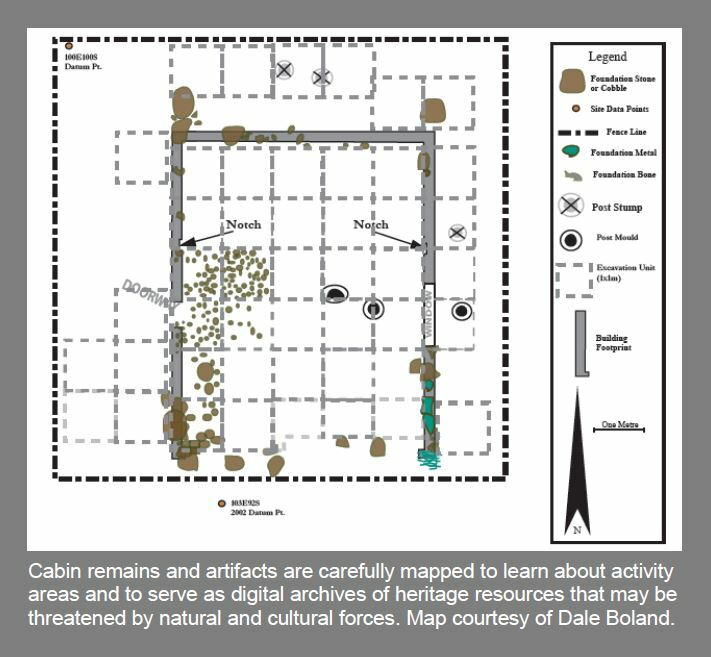 There are over 550 recorded archaeological sites in Alberta with cabin components. Over 115 of these sites also have a pre-contact First Nations component, which suggests that many of the good spots for cabins have always been good places to make a living on the land. The painting at the top of this article by Gregg Johnson is of a trapper’s cabin in the autumn foothills. It captures the solitude of the trapper’s life. Autumn was a busy time as trapper’s geared up for winter. Supplies were brought in, trap lines were re-established, and wood was cut for the long winter ahead. Like many of Alberta’s industries, modern trapping has an interesting past and an informative historic record. Archaeology offers a unique opportunity to learn about the past lives of people who may not be represented in historical accounts. In this sense, the study of historic resources gives a voice to people who have not been given the chance to speak for hundreds of years. An example of a current research project about cabins that will illuminate the past record of a poorly understood group of people is that by Dr. Kisha Supernant at Buffalo Lake. Dr. Supernant and her research team from the University of Alberta are studying the adaptations of Metis and First Nations people who occupied Buffalo Lake in the 1800s in order to acquire meat that supplied neighbouring trade posts like Fort Edmonton. Her excavations and mapping program will uncover an important way of life that helped shape our province. 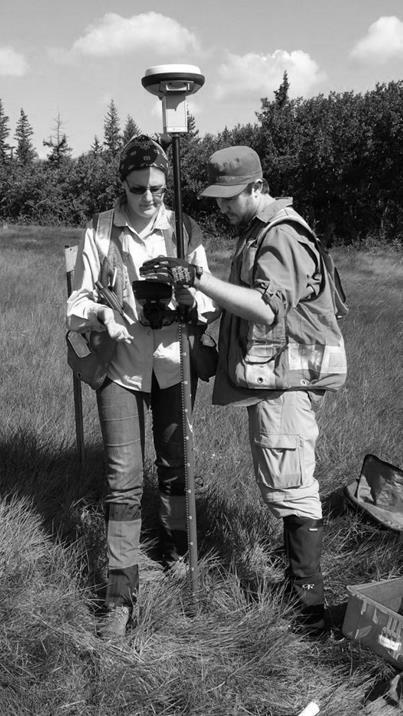 Dr. Supernant and a graduate student use GPS equipment to map archaeological features. The next blog of the Heritage Art Series will be about the changing landscape and rock art of Writing-on-Stone Provincial Park. Languishing historic downtowns were revived, once again attracting businesses and customers. Modest but beloved churches were repaired to continue to serve their congregations and communities. An exquisite sandstone prairie mansion where history was made, the Lougheed House, was painstakingly restored to become a vital museum and events venue. These were some of the highlights of Tom Clark’s ten-year stint on the Board of Directors of the Alberta Historical Resources Foundation. 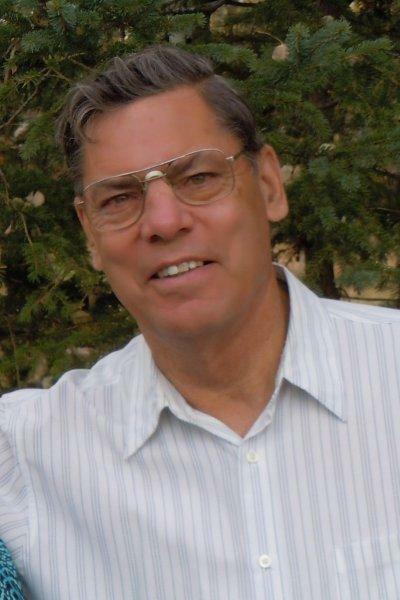 Tom applied to join the Foundation’s board while serving on the Clearwater County Council for two terms and while chairing the Nordegg Historical Society (which he still does). His experience working with community groups and addressing heritage conservation concerns prepared him well to fill a spot on the board. Tom Clark, former Director of the Alberta Historical Resources Foundation. While the Foundation supports a number of programs, “the big thing was the adjudication of funds that people have applied for over the years for their different projects,” Tom explains. “There is an awful lot in the province…that needs restoration,” he notes. To maintain their integrity, historic places need the injection of funding and technical expertise that the AHRF can bring them. The Foundation—which gets its money from the Alberta Lottery Fund—provides funding to projects that preserve historical resources or raise awareness of heritage in Alberta. Grants are awarded through three programs: the Heritage Preservation Partnership Program, the Alberta Main Street Program, and the Municipal Heritage Partnership Program. The last two programs are specifically for municipalities, but grants from the Heritage Preservation Partnership Program are available to anyone working to conserve or increase public awareness of a historic resource. They are awarded in five categories: Historic Resources Conservation, Transportation/Industrial Artifact Conservation, Heritage Awareness, Publications, and Research. There are also two scholarships: the Roger Soderstrom Scholarship and the Bob Etherington Heritage Trades Scholarship. In addition, the Alberta Historical Resources Foundation oversees the Provincial Heritage Markers Program (“if you’re familiar with those big blue historic markers throughout the province,” Tom says, “we were responsible for [selecting the topics for] those”). Tom explains that the Foundation is “also responsible for [approving recommendations for] the naming of places—if you wanted to name a mountain after your grandmother [while Tom was on the board], we reviewed it” (and probably rejected it). One of the most memorable aspects of the Foundation’s meetings, from Tom’s perspective, was they are held in different spots around Alberta. As a result, Tom says, “In the ten years I’ve seen an awful lot of this province, and [have seen first hand] the projects that people were doing.” Last February, the board met in the town of Olds, where board members saw several properties that have benefitted from conservation grants from the Foundation, including the Dr. Hartman Residence, the Brown Residence, the Kemp Block, and Maybank Drug Store. The Town of Olds has received much help from the Municipal Heritage Partnership Program over the years, including funding and advising to produce a heritage survey, inventory, and management plan. Tom continues: “In the late 1980s, the Nordegg Historical Society formed and proceeded to work diligently to try to preserve some of that [history]. Over the years, we got it to the point where we can take tours of it.” It is now both a National Historic Site and a Provincial Historic Resource. Alberta Culture has developed a comprehensive website that explores and promotes a deeper appreciation for the rich history of energy resources in our province and their role in shaping Alberta’s past, present, and future. The Energy Resources Heritage website explores the Alberta history of coal, conventional oil, oil sands, natural gas, electricity and alternative energy. It also profiles Bitumount, the pioneering industrial facility north of Fort McMurray that laid the foundations for Alberta’s modern oil sands industry. 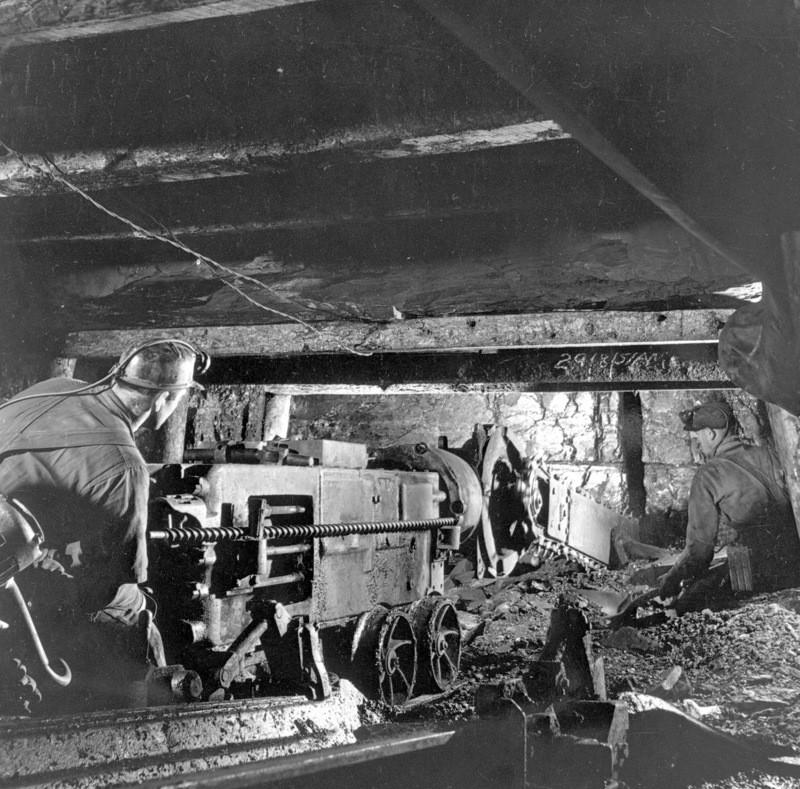 The coal section of the Energy Resource Heritage Website examines the history of coal from the earliest times through the Industrial Revolution and the development of the coal industry in Alberta. It explores how the science and technology associated with coal mining has evolved, and how the industry responded to the sharp decline in demand for coal with the rise of oil and natural gas use after World War Two. It also explores topics relevant to the social history of the coal industry in Alberta, such as the evolution of coal towns; the roles played by women and children in coal communities; and the emergence of organized labour, which fought for better wages and safer working conditions in one of the world’s most dangerous industries. 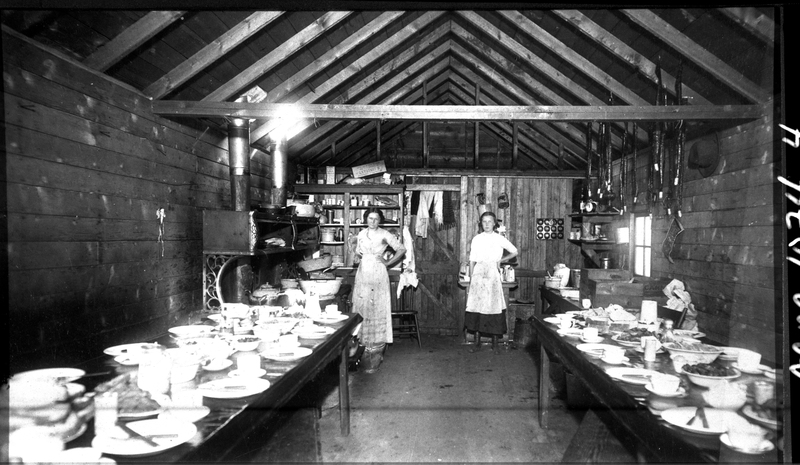 Two women stand in a cookhouse at Newcastle Mine in Drumheller Valley, ca. 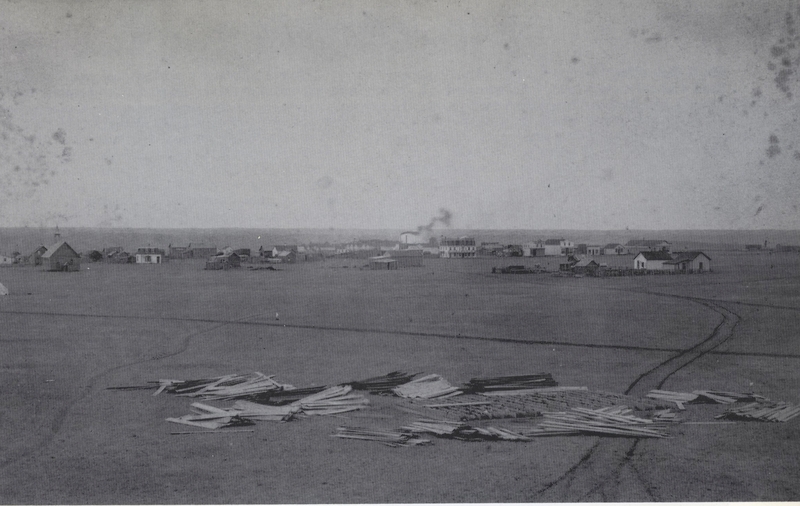 1912; Newcastle was one of the first mine operations in Drumheller Valley to establish a cookhouse, which fed up to 100 miners three times a day. The history of coal use by humans stretches back thousands of years, as coal’s ready availability and different properties have long made it a valuable resource in many parts of the world. In addition to burning it for heat, ancient peoples used coal for cultural and artistic expression. Bronze Age people in Wales, for example, incorporated coal into their burial customs, while ancient artisans in China carved coal into jewelry and other ornamental items. Similarly, First Nations people in Alberta used coal for decoration and carving, such as the extraordinary bison sculptures unearthed in a farmer’s field near Barrhead in 1949 (now housed at the Royal Alberta Museum). 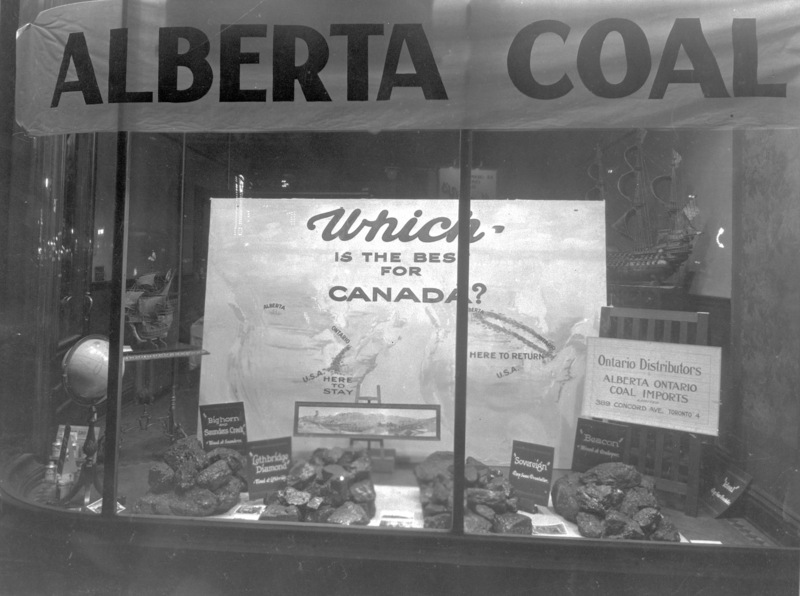 An Alberta coal company advertises in Ontario, n.d. The key turning point in the history of coal was the Industrial Revolution. As the primary fuel that drove steam engines in factories and railroads, coal became extremely valuable and was mined on an enormous scale. Railways quickly took over from watercraft as the most important means of commercial transportation, which in turn had a decisive impact on the history of Alberta. In 1881, the Canadian Pacific Railway was contracted to build a railway line across Canada and the company turned to the rich coal seams of Alberta as a crucial source of fuel. The province’s early coal industry was centred in southern Alberta (primarily near Lethbridge and in the Crowsnest Pass) but as rail lines spread throughout the province other centres of coal production emerged, including Drumheller and the communities of the Coal Branch. The rise of major cities like Calgary and Edmonton further drove the demand for coal, both for heating and for the generation of electricity at the province’s earliest coal-fired power plants. Coal thus played a crucial role in the growth of Alberta in the late nineteenth and early twentieth centuries – it attracted investment and immigration and led to the development of some of Alberta’s earliest communities. From the earliest use of coal to the challenges faced by the industry today, the coal section of the website offers visitors an introduction to the fascinating history of one of Alberta’s most important natural resources. Those attending the recent Alberta Main Street Coordinator’s meeting in Lethbridge took a walking tour of downtown Lethbridge led by Downtown Lethbridge Business Revitalization Zone (BRZ) Executive Director Ted Stilson and complimented by the always-engaging historical anecdotes of Belinda Crowson, President of the Historical Society of Alberta. During the tour Ted mentioned several initiatives of the BRZ and local community that are making downtown Lethbridge an attractive and vibrant place to be. 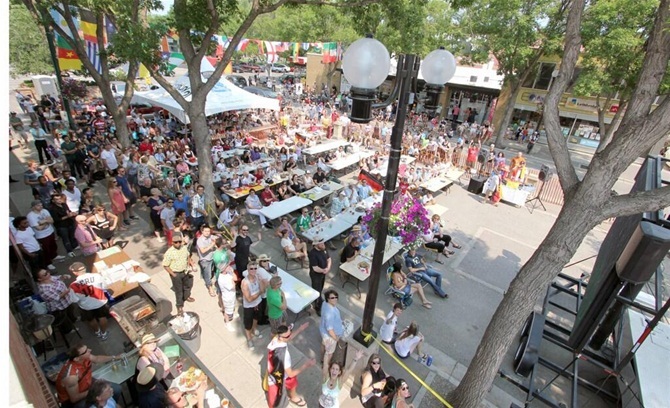 The BRZ has been active since 1988 but really started to have an impact when they partnered with the Alberta Main Street Program and the City of Lethbridge in 2000 (the BRZ and Lethbridge Main Street are now one and the same). The first major infrastructure project undertaken by the City in the downtown included improvements to Festival Square – an adaptable outdoor public space fronting Galt Gardens and located just outside the BRZ office. This flexible space allows for temporary road closures to host events and is home to the downtown Farmer’s Market. This past summer the Southern Alberta Ethnic Association, Heart of Our City, business sponsors and the Downtown BRZ hosted World Cup celebrations in Festival Square. A portion of Festival Square was cordoned off for an LED screen, public seating and a beer garden. Over 500 residents attending the final games and total attendance for the week was over 2,000. Impressive! One of the first things you will notice about downtown Lethbridge is that it is spotless. This can be attributed to the very successful Clean Sweep Program that has been in operation for approximately seven years and employs up to 15 individuals from local shelters for part-time work to water plants, clear snow and pick up litter in exchange for a wage and transition to more stable housing opportunities. For the past four years the BRZ has administered the program under contract from the City and works closely with local agencies to run in the program. The Clean Sweep team also picks up cardboard and does detailed snow removal/lawn maintenance under contract with individual businesses. 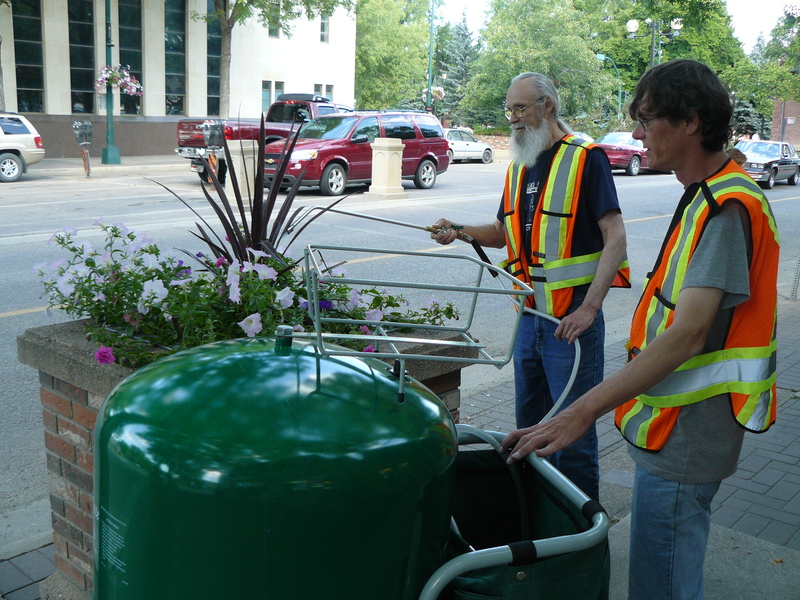 During my most recent trip to Lethbridge for the Main Street meetings I was up with the sun for two (very silly) early morning jogs – both days I encountered friendly faces of the Clean Sweep Program hard at work. Downtown Lethbridge has a very successful graffiti removal program. 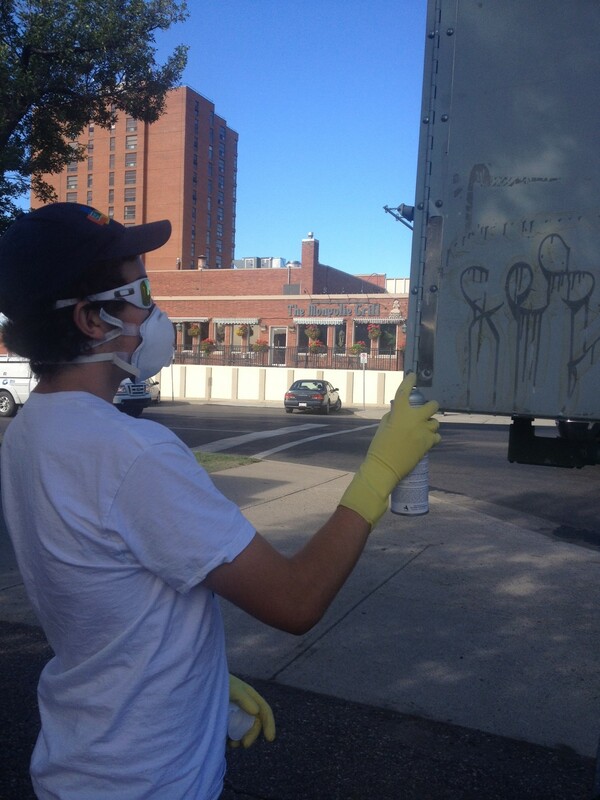 For over two years the City has employed a graffiti removal team who are responsible for year-round, City-wide service. Additionally, for 10 years the Downtown BRZ has contracted a graffiti removal company that can provide service within 48 hours for downtown-specific requests. It’s old. Covering more than 30 blocks, downtown Lethbridge includes more than 100 buildings that are more than 50 years old. Built in 1908, Fire Hall No. 1 is the oldest standing brick fire hall in Alberta. There is a lot to eat. Having experienced a recent diversification of dining options, downtown is now home to 45 restaurants. Historic Main Street is getting a facelift. Plans are in place for reducing traffic from four lanes to two lanes, planting trees and widening the sidewalks as part of a streetscape improvement project for Round Street (5th Street), projected to occur within the next three years. Funding is already earmarked for a similar streetscape improvement project on 3rd Avenue. More people are starting to live there. Downtown is starting to see an increase in the conversion of second storeys into residential units. Anti-sticker stickers work. The (ironic) application of stickers reading ‘No Unauthorized Postering or Stickers Allowed’ has been extremely effective in reducing visual clutter on street furniture (along with the simultaneous installation and promotion of poster collars). The next time you are passing through Southern Alberta, take a few hours to stop in and check out downtown Lethbridge – you will be happy that you did.